A Glasgow-bound flight was diverted to Manchester Airport as gale force winds battered the north. The easyJet plane attempted to land twice in Scotland before the freak weather forced it to divert to Manchester. It left London Gatwick at 7.35am and was diverted to Edinburgh after weather prevented the flight landing at Glasgow. A second landing at Edinburgh also failed as the storm moved eastwards. The incident highlights the need for air passengers to have up to date travel insurance to protect against unscheduled delays and diversions. "I'm feeling really lucky to be alive," passenger Hazel Bedford, who works for Cancer Research UK, said. She said after a "normal" take-off, the passengers were told by the captain to expect delays while landing and that the flight "could be a bit bumpy north of the border". However she added: "But we got further north and suddenly everything started shaking and bumping, we were going up and down, up and down, like a roller coaster. It looked like we were going to land as normal and were just above the buildings when we were suddenly in full climb again." Ms Bedford said the crew explained the flight would be diverted to Edinburgh, where weather conditions were believed to be better. "We came into land in Edinburgh and again the same, it felt like we we're hitting big air pockets and dropping huge distances," she said. "We were ten feet of the ground and being buffeted from side to side and the same thing happened; we abandoned the descent and went into full climb. "An awful lot of people were being sick but the plane, it was incredibly quiet. When cabin crew said 'we're going to Manchester', people started to realise this was serious. "All I could think of was my new year's resolution this year, which was to write my own will, and I haven't done it. It was that frightening. I was absolutely terrified." 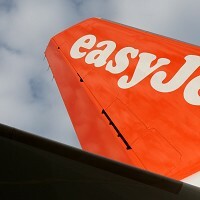 easyJet confirmed the flight, which was carrying 112 passengers and six crew, made the diversion due to adverse weather. "The captain had planned initially to land in Edinburgh but high winds meant this was not possible and so took the decision to divert to Manchester Airport," a spokeswoman said. The airline apologised for the inconvenience caused and flew passengers to Glasgow, adding that some passengers had opted to return to Gatwick. The spokeswoman added that passenger safety was the firm's highest priority.